Jundla ,Karnal. Affilated to Kurukshetra University and Approved by NCTE. Ch Pratap singh charitable trust has opened Pratap College of Education in Jundla. The Pratap Educational Institutes are run and managed by Rai Sahib Ch. Pratap Singh Charitable Trust which was registered in June, 1964 by our founder Rai Sahib Ch. Pratap Singh.The Trust established the Pratap Public School, Jarnailly Colony in 1975, and slowly but steadily the school made phenomenal progress. In 1985 the Pratap public school was affiliated to Central Board of Secondary Education for instructions upto the X Standard and it was upgraded to the Senior Secondary Level (10+2) in 1989. In 1991 the Trust purchased a five acre plot of land from HUDA in Sector-6 Urban Estate, and a more spacious and multi-disciplinary complex for imparting education from Nursery to Senior level (10+2) started functioning in 1992. And Fulfilling it's commitment to take education to rural areas, Rai sahib Ch. Pratap Singh Charitable Trust society,opened Pratap Public School Jundla in march 2009. Besides preparing the students to excel in Board Examinations, the schools lay considerable emphasis on their holistic development through co-curricular activities.Training in Computer Science and sports occupies a prominent place in the schools numerous activities. Within the campus, facilities have been provided for outdoor games like athletics, lawn tennis, cricket, basketball, volleyball and a lots of other cultural activities.With only 80 students in January, 1981,the schools today have a strength of over 5500 students. And now with objective to produce quality teachers, Trust has taken the initiative to open Pratap Education College. Dr. R.S. 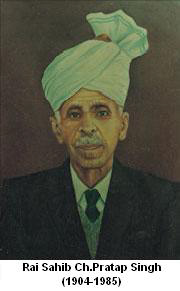 Bhatia was an educationist, academician, environmentalist and a philanthropist. A visionary and a man ahead of his time – Dr. R.S. Bhatia took on education as his mission with the belief that education paves the way for progress and development. A warm and compassionate human being, he draws people to himself. His commitment to the cause of education has been the focus of his entire life. Dr. R.S. Bhatia was born at Shujabad, district Multan in Pakistan on the 24th November 1924, to one of the most affluent families of Punjab. He had his early education from St. Anthony’s Convent School at Lahore where he completed his Senior Cambridge. He did his Higher Cambridge from Aitchision College and graduated from Government College, Lahore with Economics in B.A. (Hons.). He got his Post-Graduate degree from Indiana University , Bloomington and earned a Doctorate Degree in Economics from Columbia University, New York. He is widely travelled and had the opportunity to interact with peoples of various cultures. On his return to India in 1954, he taught at three places as a Professor in Economics, at Agra, Pilani and Kurukshetra. He enjoyed teaching and developed a rapport with his students. He resigned in 1981. Dr. R.S. Bhatia was not only a voracious reader himself but has, for more than three decades, catered to the intelligentsia of the city. The Pratap Public Library has a host of books, reference books of various subjects also widely used by the students of Universities. It subscribes to 14 daily and 35 weekly, several fortnightly and monthly magazines. New books are added year after year to the 60,000 or more collection of books. He took over the reigns of the school in 1981 when it was yet in its initial stage with 80 students. Today, Pratap Public Schools stand as a pulsating edifice. Over 5000 students learn under the guidance of able teachers in the hallowed portals of the institution. Dr. R.S. Bhatia was a philanthropist. His altruistic attitude towards social issues is truly noteworthy. He was an ardent social worker. He patronizes many social institutions. He was always in the forefront in reaching out in times of peril, natural calamities or disasters. Distressed by the misfortunes of the Tsunami victims, the cyclone affected parts of Orissa and the earthquake at Bhuj, Dr. R.S. Bhatia participated large heartedly in rebuilding lives. His contribution to social causes cannot be put in words. He was a rationalist and is always concerned about rooting out superstitions and ills of the society. He had often voiced his opinion openly in his speeches and editorials. A keen observer and analyst of the events of the world, he was a true guide and indeed a living colossus. Dr. R.S. Bhatia was a cancer patient. An operation to remove his left kidney was performed at the Tata Hospital in July 1990. Cancer spread its tentacles. Therapies and radiations had sapped his strength and energy, but his undaunting and undismayed courage surges him to carry on and on. His hearing problem is something he used to say he had to live with. His forceful presence at every function infuses strength and inspiration to one and all. Even at the age of 84, he says, he still has miles to go and promises to keep. The formation of attitudes and values among children is an area that most people in the educational field do not give due emphasis. But the values and attitudes formed in a child during his school days have a very far-reaching consequence in his life and his contribution to the society. So inculcation and development of the right attitudes and values in our children has a vital role to play during the period of schooling. The schools are establishments to instruct the young with the right type of values, attitudes and dispositions that would support the society. In many ways they can teach and reinforce in our children attitudes towards law, government, citizenship etc. Our schools can go miles ahead to achieve the aim of development of attitudes and values with the co-operation of the eminent faculty. Approved by National Council of Teacher Education and affliated to KUK University.